ASUS shows off the E45M1-M PRO, a new Fusion motherboard with AMD's E-450 APU. Full specifications at VR Zone. Motherboard major ASUS unveiled a new micro-ATX motherboard based on the AMD E-450 accelerated processing unit (APU), the E45M1-M PRO. 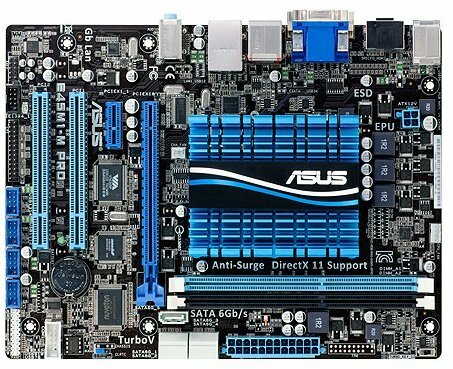 This board is nearly identical to the E35M1-M PRO, except of course its faster APU. The AMD E-450 is clocked at 1.65 GHz, a mere 50 MHz jump over the E-350, but the real improvement here is that the GPU core speed that jumps to 600 MHz thanks to TurboCore technology. The E35M1-M PRO is a micro-ATX motherboard measuring 244 x 183 mm. It is powered by AMD E-450 Fusion "Zacate" processor platform, aided by AMD Hudson M1 chipset. The platform offers a wealth of connectivity and performance per Watt for its price. The E-450 APU and Hudson M1 chipset are cooled by a common low-profile heatsink, an optional fan can be attached to it for better cooling. A 3-phase VRM powers the APU, which is goverened by an ASUS EPU chip that works to improve energy efficiency. The APU is wired to two DDR3 DIMM slots that support single-channel DDR3 memory with speeds of up to 1333 MHz.